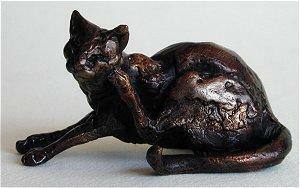 Beautiful small bronze sculptures that truly capture the grace and sense of what a cat is like. For cat lovers they will call to mind ones own cat. For non cat lovers they may give you a reason why perhaps you should give them another look. What makes these pieces remarkable is the size. My large photos tend to be bigger than life size as the pieces range from 2 inches to 5 1/2 inches. To capture the feel in so small a scale takes an amazing talent. Paul Jenkins has just such a skill and although better known for his larger pieces these small bronze castings are not to be missed.